Sample the sights, sounds and tastes of India! 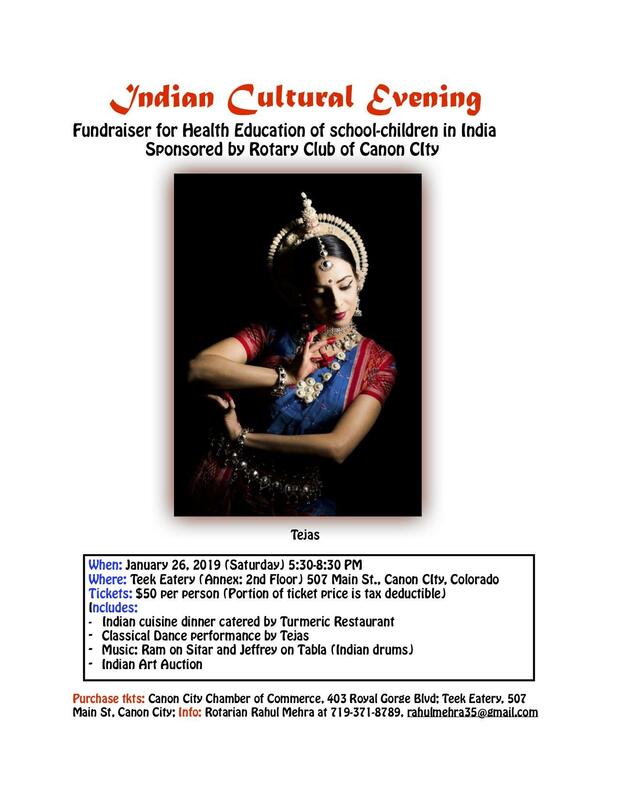 Join the Rotary Club of Cañon City for an Indian Cultural Evening on Saturday, January 26, 2019 from 5:30 – 8:30 pm at Teek Eatery Annex, 507 Main St. in Cañon City. The evening includes an Indian cuisine dinner catered by Tumeric Restaurant, a classic Indian dance performance, live Indian music and an auction of Indian art. Cost is $50 a ticket, a portion of which is tax deductible. This tasty and fun fundraiser will help to raise money for health education for school aged children in India. Monies raised from this dinner and other efforts through the CC Rotary Club will be matched by a grant from the Rotary Foundation. The project is the brainchild of CC Rotary member Rahul Mehra, a native of India. Mehra’s non-profit organization Indian Health Alliance is dedicated to health promotion to youth in India. India has the highest disease burden of any country in the world and most families cannot afford good healthcare. With the help of the Cañon City Rotary Club and other Rotary clubs, the Health Education curriculum has been developed and the student books and Teachers Manuals have been printed in English and will soon be translated and printed in Hindi. After evaluating the curriculum in 1000 students in Chandigarh, India the ultimate goal is to make Health Education mandatory in every school in the country.